The oldest living person in the UK is celebrating her 113th birthday at a nursing home in Leeds. 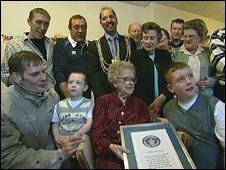 Guinness World Record holder Florence Emily Baldwin, known as Florrie, was born in the city on 31 March 1896. Mrs Baldwin, whose husband Clifford died in 1973, once met Queen Victoria in Leeds, was 16 when the Titanic sank and 73 when man landed on the moon. Mrs Baldwin's family said she was still putting up new curtains and cleaning windows at the age of 105. They said she was a single-minded lady who had been fit all her life and had not even been registered with a doctor until she was 104. Her only contact with the medical world had been a cataract operation when she was in her 80s. Charlotte Hughes was 115 years and 228 days when she died in 1993, and is still the oldest Briton ever. Last Sunday, World War 1 veteran Henry Allingham became the oldest ever British man, after clocking up 112 years and 296 days.